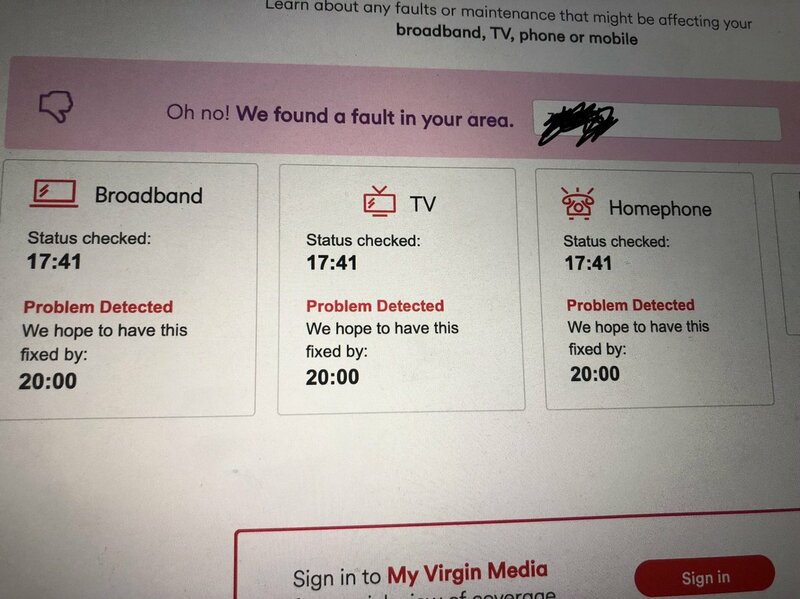 Is Virgin Media Ireland Having an Outage Right Now? @VirginMediaIE is there an issue with broadband in the drimangh area, no connection this morning...thesis work to do. @VirginMediaIE Is there a fault in Dublin 8? Cannot get any kind of connection. @VirginMediaIE Still no broadband connection. Can you give an update and an estimate time for a fix? @VirginMediaIE lucan right now, one device, trying to work. Is there an issue? @VirginMediaIE Tallaght outage due to scheduled maintenance. Any chance you could forewarn subscribers? @VirginMediaIE internet Foxrock Avenue Dublin 18 not working Is there an issue? @VirginMediaIE is Internet down in Dublin 8? Can't seem to get a net connection at all. Have restarted router a couple times to no avail. @VirginMediaIE okay, that’s enough now, this isn’t going to be fixed today, is it? @VirginMediaIE Hi. My TV and broadband internet has not been working since 12pm today. Are there any issues in Dublin 24? @VirginMediaIE any outage in Kilnamanagh Tallaght?